HM Land Registry does not give legal advice but we are aware that practitioners want clarity about our policy and practice relating to electronic signatures (e-signatures) on documents and deeds. The Law Society practice note on the execution of a document using an e-signature states that it is aimed at parties who wish to execute commercial contracts. It also includes a section suggesting that deeds may be executed and witnessed using e-signatures. We will not comment on the views expressed in the guidance note but set out HM Land Registry’s views here. Section 52 of the Law of Property Act 1925 requires that the legal estate in land or any interest in it must be conveyed or created by deed (apart from the limited exceptions listed in section 52(2)). It is clear that the Law Commissioners when working on the Land Registration Act 2002 were not convinced that an electronic document with an electronic signature could be regarded as a deed without a statutory provision confirming that to be the case. The statutory provision is in section 91 of the Land Registration Act 2002. Section 91(5) confirms that an electronic document will be regarded for statutory purposes as a deed if it complies with the provisions of that section. The section applies when an e-document purports to effect a disposition of a registered estate, charge, or a noted interest, or is a registrable disposition. As well as other conditions set out in section 91, the section provides that to be regarded as a deed the disposition must be of a kind specified in rules, and meet any other conditions included in the rules. The rules made under that section are currently the Land Registration (Electronic Conveyancing) Rules 2008. Will HM Land Registry only accept e-deeds that satisfy section 91? HM Land Registry will not accept an e-document with an e-signature as a dispositionary deed for registration unless it complies with the provisions of the 2002 Act and 2008 Rules. The electronic mortgage service for which the 2008 Rules were made is not currently in use, but Land Registry is working on a new Digital Mortgage service that will initially rely on the 2008 Rules. In due course we plan to make amendments to our Rules to allow for more electronic conveyancing transactions and registration services. HM Land Registry expects the highest standards for the authentication of deeds relating to registrable dispositions, whether they are paper or digital. We intend to use our own purpose-built electronic signature solution for the authentication of the new digital mortgage. The solution will provide an advanced electronic signature, which is defined in EU Regulation No 910/2014 on electronic identification and trust services for electronic transactions – (the “eIDAS Regulation”). An advanced electronic signature must meet the following requirements (Article 26). It is uniquely linked to the signatory. It is capable of identifying the signatory. It is created using the electronic signature creation data that the signatory can, with a high level of confidence, use under their sole control. It is linked to the data signed in such a way that any subsequent change in the data is detectable. Electronic signatures are not witnessed. Indeed it is not possible for an electronic signature to be physically witnessed in the way that a pen and ink signature can. An electronic document is a collection of data in a computer system, and the electronic signature is another data string that is attached to it. The e-signature is applied to the data within a software system, or in a hardware security module, or some other computing device. A person cannot witness that process. A “witness” might stand behind someone typing on a keyboard, and see some writing on the screen indicating that the person typing has electronically signed the document shown on the screen. But the “witness” but could not be sure that the signatory had electronically signed the data that the screen purports to represent, or that the screen represents the data that is intended to be signed. That is why electronic signing relies on trust services, which provide certification as to the identity of the person who is applying the electronic signature, and protection to the integrity of the data that has been signed. Consequently, section 91 of the Land Registration Act 2002, which deals with electronic dispositions for the purpose of land registration, refers to e-signatures being certified (s.91(3)(c)). Certification of an electronic signature takes the place of witnessing. It effectively transposes a notarial model into the digital environment. The title of the eIDAS Regulation makes it clear that the questions of establishing the identity of the persons signing documents electronically, and establishing the integrity of the document, are fundamental to the use of e-signatures. In other words they serve a similar function as a witness in the paper world. A reading of the definitions section of the Regulation (Article 3) shows that establishing the identity of someone purporting to electronically sign a document is vital to establishing its evidential value. To understand certification it is useful to have a basic knowledge of the eIDAS Regulation, since it sets the standards, responsibilities and liability for trust service providers and for e-signatures throughout Europe. Even when Britain leaves the European Union it appears that the Regulation will become British law under the proposed Great Repeal Bill announced by the Prime Minister. HM Land Registry will be a trust service provider, certifying the identities of those who are signing digital mortgages, and providing the e-signature for them. The trust certificate issued with the e-signature links the signature data to a natural person and confirms their identity. 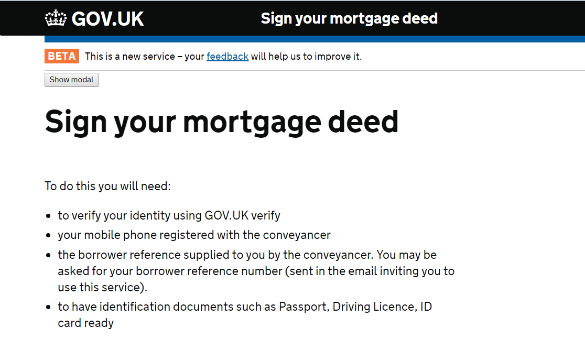 For the verification of identity, HM Land Registry currently proposes to use a combination of the information provided by the conveyancer together with the GOV.UK Verify service. More information on the new Digital Mortgage service will be issued in due course. HM Land Registry does not register contracts but can note them in the register of a title affected by the contract, pursuant to section 32 of the Land Registration Act 2002. Section 32(3) confirms that the fact that an interest is the subject of a notice in the register does not necessarily mean that the interest is valid, but does mean that the priority of the interest, if valid, is protected for the purposes of sections 29 and 30 of the Act. If a contract, signed using electronic signatures of whatever kind, is sent to HM Land Registry with an application to note it, we can enter a notice on the affected register, provided other requirements for the entry of a notice are satisfied. The proviso in section 32(3) applies equally to both agreed notices and unilateral notices (the main difference between them being the procedure for cancellation). In the event of a challenge to an electronically signed contract it would be for the court to decide on its legal effect if the parties could not agree. If the document was found to be invalid there would not be a mistake in the register, since the validity of the document is not guaranteed by noting. Can a physical signature still be undertaken in another country? My partner is abroad and I am in UK. Therefore, I will sign here in front of a witness and she will sign abroad with a witness - will this suffice or does she need to be physically present in this country? Habib - as far as I'm aware where you are when you execute the deed is irrelevant. How would anyone know? Well because I accidentally told my lawyer that my partner is out of the country while I am here. I'd like to point out that the Rules of S.95 as set out in the Land Registration (Electronic Conveyancing) Rules 2008 only apply to a charge over the property. They don't address any question of Rules when it comes to normal transfer from one owner to another, as to how this is done to the satisfaction of Land Registry. It does seem as if the Land registry on the one hand wants to use the GOV.UK Verify service, on the other hand being required to have certification to the Electronic Transactions Regulations 2016, where the Verify service isn't registered as a service provider? ALoadofBull - we are unclear as to what it is you are really querying here and wondered if you could perhaps clarify further? We have approved the comment for others to note but have removed the link to a third party website. David - I apologise for the delay in replying. Your points are being considered and we hope to be in a position to respond on Monday. As mentioned in the article, we will not comment on the views expressed in the Law Society’s practice note and cannot give legal advice. But, from HM Land Registry’s perspective, section 91 of the Land Registration Act 2002 allows the registrar to accept a document executed electronically as a valid registrable deed if (among other things) it makes a disposition of a kind that is specified by land registration rules, and the e-document and e-signature complies with those rules. As explained in the article, we have the current set of Land Registration (Electronic Conveyancing) Rules 2008 (made under section 91(2)) that we can rely upon for the introduction of our new digital mortgage service. Those Rules mean that the e-document and its e-signature must be in a form provided by the Registrar, and allow only for simple mortgages. We are currently testing a new version of a digital mortgage, and hope to be able to release it for use soon. Proposed amendments to the Land Registration Rules 2003 would enable us (when circumstances allow) to widen the range of e-documents (with e-signatures) that can be accepted as deeds under section 91(5). Can a disposition which needs signed be signed with an electronic signature? Sarah - the blog relates electronic solutions which may be introduced at some stage, but these are currently still at their formative / test stages. Currently, the dispositionary form will need to be signed as set out in our guidance, for example, as shown in the notes on the TR1 form page - https://www.gov.uk/government/publications/registered-titles-whole-transfer-tr1 .